We began our pilgrimages in 1990 with 30 Earth Treasure Vases and have buried 29 of them. 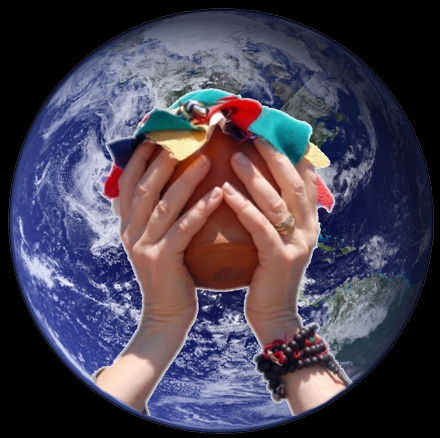 On the solstice/full moon in June of 2013 we accomplished the final Earth Treasure Vase burying it in Australia. This completed and activated the global treasure vase mandala, over two decades in the making. There is one final vase that we call the Seed Vase, which is dedicated to seeding the next chapter of our work in sacred activism and our Earth Treasure Vase practice. Stay tuned for information about how we see this practice evolving. Let us know if you’re interested in participating in any way! The essence of the next phase of our work is acknowledging, becoming, and cultivating our selves as holy vessels of transformation — filled as we are with our own sacred treasure and offerings to the Earth — and facilitating that transformative experience among others. Now, when all planetary ecosystems are threatened and all species are endangered, this practice invites individuals and communities everywhere to come together and strengthen our shared intention for restoring wellbeing to the Earth. The practice transcends political, cultural and spiritual differences in a common language of caring and compassion. 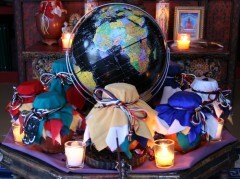 Working with the Earth Treasure Vases teaches us to give expression to our own unique gifts, which will surely help to re-build the collective body of the Earth into a harmonious and balanced state of creative vitality. When we offer prayers for the healing and protection of the Earth, wholly and completely, action follows and reflects the depth of our commitment. To accomplish the Earth Treasure Vase practice, the vessels are taken into a community meditation, filled with sacred and symbolic offerings over many months, ceremonially sealed, and then buried all over the world in places of need — never to be disturbed. As we travel and make relations with indigenous elders and young activists, we are cultivating an independent grassroots network that includes prayer as a universal gesture of help and healing. We are also planting seeds that may grow into actions that lead to real change. Our meditations and prayers bear witness to the poison of toxic waste and the inhumane torture inflicted on people, animals and plants. From the backwaters and jungles, the remote highlands and arctic villages, we have joined together in ceremony with members of local communities imagining a world without suffering. As we create this mandala of peace and healing, we also share the tools of communication that can link the planet in ongoing dialogue and prayer to support an awakened spirit of compassion in action and mobilize protection where it is needed to restore balance to this Earth once again.